Did you ever wanted to print a Form without calling any native code? Well, with Windows Forms and Visual Studio 2008 this is a really simple exercise. When you design your WinForms-Application you’ll find a Tab Visual Basic PowerPacks in the Toolbox of Visual Studio 2008. In this Tab, you’ll find a component called PrintForm. Simply drop this component on your form, and you’ll find all the functionality you need. Let’s take a look at a small sample by using a very simple Windows Forms application. 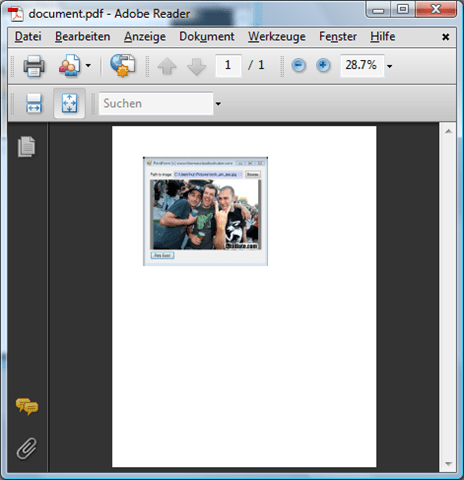 The application just has a Browse-Button to browse an image from the filesystem, a PictureBox to display the image and a TextBox displaying the path to the image. The Browse-Button does nothing more than showing an OpenFileDialog and setting the Text-Property of the TextBox to the selected file and assigning the chosen image to the Image-Property of the PictureBox. Filter = "JPEG (*.jpg)|*.jpg|JPEG (*.jpeg)|*.jpeg"
The Form above already contains a "Print Form!"-Button. The eventhandler of that Button is currently empty. Let’s implement it. But before that, go to the designer and drag’n’drop a PrintForm-component out of the Toolbox on the Form. 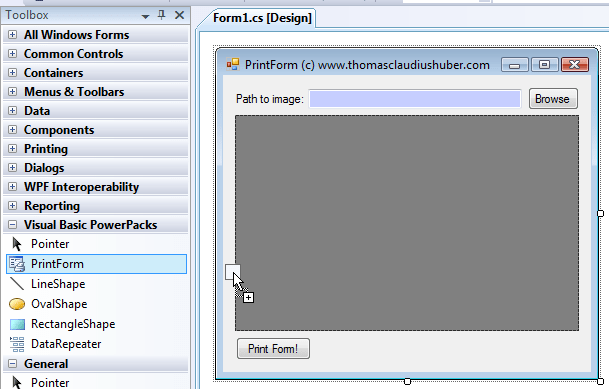 After dropping the PrintForm-component, you’ll find it in the Component Tray of the Windows Forms-Designer. It’s named printForm1 by default. I won’t change that here. Now let’s step to the EventHandler of the "Print Form!"-Button. 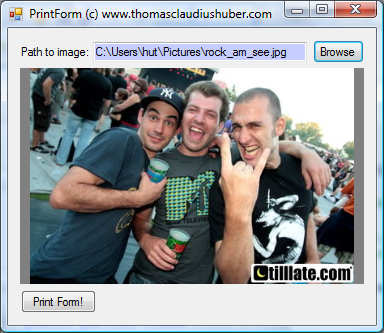 To print the form, first a PrintDialog is shown allowing the user to select a printer. Then the settings of the PrintDialog are assigned to the PrinterSettings-Property of the printForm1-component. The Print-Method on that component is called passing in the Form (this) and an Enum-Value specifying to print the full Window. Beside the PrinterSettings-Property the PrintForm-Component contains some more important properties . The most mentionable one is the PrintAction-Property. It’s of type PrintAction, an enum in Namespace System.Drawing.Printing. The PrintAction-enum contains three values, PrintToPrinter (the default for the PrintForm’s PrintAction-Property), PrintToFile and PrintToPreview. Replace the code in btnPrintForm_Click with the two lines above, and you’ll automatically get a preview, like shown below. But be careful. The user can print out of the Preview. If you’ve no PrinterSettings assigned to the PrinterSettings-Property of the PrintForm, the Print will be implicitly written to the users default-Printer. So, that’s all. Get the sample here. First thanks for the step by step instruction on printform article. I have two forms, form1 and form2. On button click on form 1 I am sending some values to form2 and displaying it. I want to print only form2 with the displayed content. Is it possible to do it. simple code but rocks! help me alot! I was struggling with Print Dialog and Print Document Tools. This was a life saver. Thanks a ton! My form is bigger than the screen and has a datagridview of a sub-table on it of meeting dates, checkboxes and text field. I need this all to print – ok if it goes to 2 pages. Sorry, I don’t get it. About what program are you talking? How to Test Code that Uses Singletons like Application.Current.Dispatcher?